Jack Ketch in The Plotters Ballad (1678-9). Ketch is seen right of center holding a rope and an axe. Jack Ketch, otherwise known as John Ketch or Richard Jaquet, began his twenty-three year career as London’s leading executioner in 1663. He was not the only executioner dispatching the condemned at Tyburn, but he was the most infamous, earning a reputation for brutality remarkable even for a man in his profession. Even after his death in 1686, his name became slang for any executioner, the devil, and even death itself. Overtime, his reputation took on such epic proportions until that he became a sort of bogeyman. So who was he? 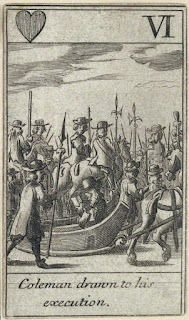 Coleman drawn to his execution. Ketch was paid for his services, and even went on strike in 1682 for better wages and won. 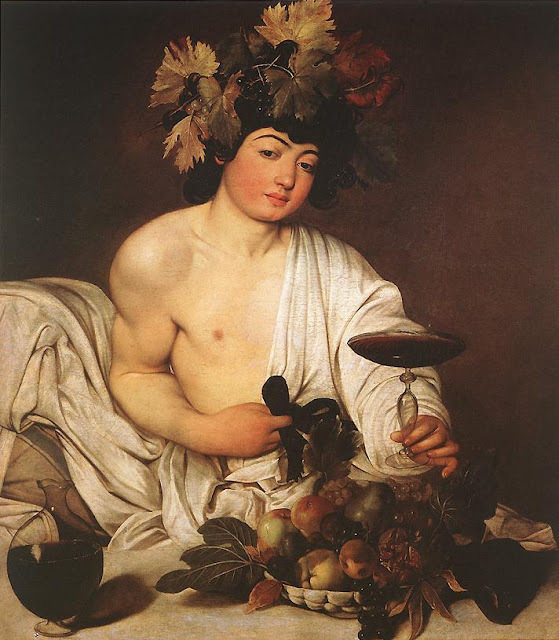 In addition to his wages, he received bribes, but he would have made most of his money by selling off pieces of the condemned. As a matter of course, executioners were given the clothes of the dead and the rope, which they sold for significant profit. A used noose could be sold for as much as a shilling an inch. Grizzly as it sounds, execution paraphernalia was widely believed to carry serious magic and was in high demand. Even so much as a strand of a hangman’s rope was believed to cure any number of ailments when it was worn around the neck, and gamblers sought pieces to improve their luck. The noose had even been used to cure headaches by wrapping it around the temples of the afflicted since ancient Rome. The efficacy of these cures was not in question, and the public was willing to pay for whatever they could get. Jack Ketch had a reputation of brutality and incompetence, but the truth might be more complicated than that. Although executions were highly ritualized, there was nothing in place that we might think of as “quality control,” and bribery was a more than frequent occurrence--it was the norm. Apart from his wages and the money he made from selling off pieces of the deceased, Ketch would have received a great deal of money in bribes. If the condemned had the coin, they would attempt to bribe the executioner for a swift and merciful death. Given the fact that there was no mechanism in place to break the neck of the condemned upon hanging at this point, many died at Tyburn of slow strangulation, a process that could take an agonizing forty-five minutes. It would have been up Ketch to set the pace of their death and to limit--or draw out--their suffering. The condemned were not the only people bribing executioners. 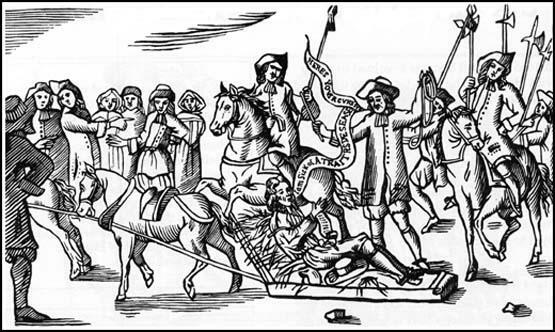 Following the horribly botched executions of Lord William Russell in 1683 and the Duke of Monmouth in 1685, rumors ran rampant that although both men paid Ketch to be merciful, their enemies paid him more to make them suffer. He denied the rumors, as anyone surely would, but one has to wonder how a man who made his living executing people for twenty-three years could fail at his task so spectacularly. He was no amateur, yet during the execution of poor Monmouth, Ketch struck him five times with an axe Monmouth himself is said to have proclaimed “too dull,” and in the end had to take the Duke’s head with a knife. 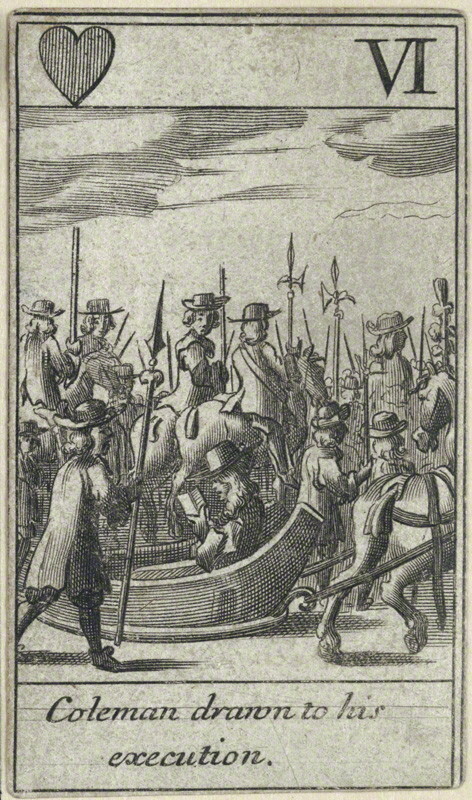 Although much of the crowd was not crazy about Monmouth, the spectacle had been so horrific that Ketch had to make his escape under the protection of a military guard to avoid being lynched. Jack Ketch makes an appearance in my book, Tyburn, as an acquaintance of highwayman Mark Virtue. For more on Jack Ketch and the history of Tyburn as a place of execution, please check out my article on The History Vault here. I just read a bizarre book from the 1830s where the author actually said "hanging is the only natural death, all other deaths are accidents." I had to read that about ten times before it sunk in. He spent the whole first chapter arguing that all people are destined to be executed in this way and that they should embrace it. I think he was nuts, but it just goes to show you the reality they were living with. It would have been so common that it wasn't even a tragedy to this man. The scale is hard to imagine.